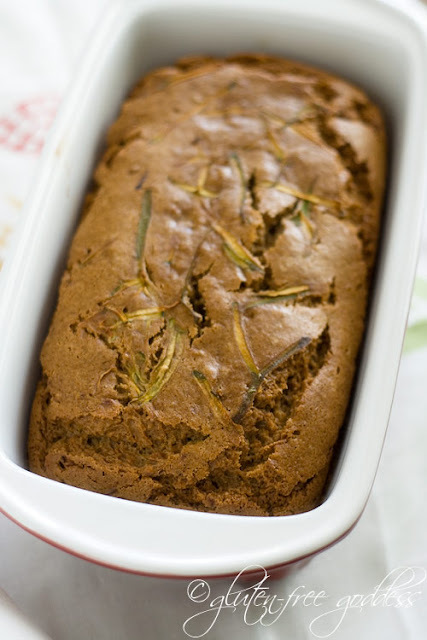 Sharing a favorite summer recipe here on Gluten-Free Goddess-- a cinnamon laced tea bread made with garden fresh zucchini. You'll love it. Now I'm off to read: The Life-Changing Magic of Tidying Up: The Japanese Art of Decluttering and Organizing --- Cheers! Here's my all-time favorite baking pan for gluten-free breads. It's a lovely glazed ceramic pan that creates steady, even heating for gluten-free batters. In other words, it's as foolproof as you can get. Find it here at Amazon: Good Cook 9-Inch Ceramic Loaf Pan . Make sure your batter isn't cold when you put it into the oven. If you keep your flours in the fridge, for instance, this will cool down your batter quite a bit. If you find your batter is cooler than room temperature, allow the batter to rest in the pan near the pre-heating stove and let it come to room temperature before you place the bread pan in the oven to bake (I also do this with cakes sometimes). The first time I tried making gluten-free zucchini bread I did not press the moisture out of the shredded zucchini and my loaf was a tad gummy in the middle from too much moisture. So pat those zucchini strands dry, Campers. If you find your tea breads and cakes turning out gummy, or falling after baking, you may want to take your oven's temperature- some ovens never quite reach the proper temperature. You can combat this by baking longer, or upping the temp a bit. If the oven temp is not the issue, then start adding a tablespoon or two less liquid to your batters (you may live in a humid climate and your flours may be absorbing moisture; too much moisture can make for a gummy product). Recipe posted August 2010 by Karina Allrich. 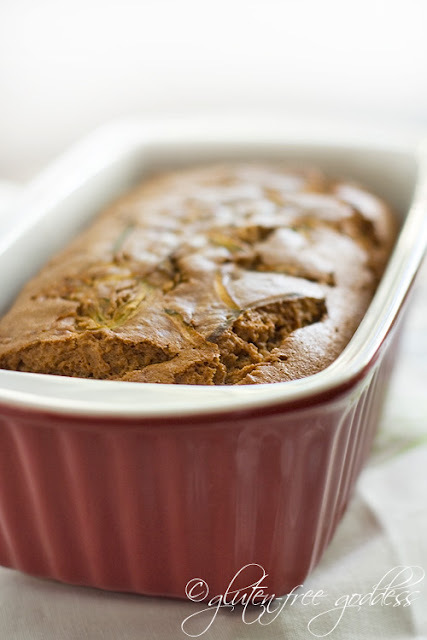 You can make this lovely gluten-free zucchini bread with or without eggs. And it's dairy-free. Its delicate flavor comes from a secret ingredient. Coconut milk. Preheat your oven to 350ºF. (Y'all know about checking the oven's temperature , now, right?) Line the bottom of a 9-inch loaf pan with a piece of parchment paper. Lightly oil it. Scoop and scrape the batter into the prepared loaf pan and using a silicone spatula , even out the top. I'm now using less brown rice and brown rice flour, and eating fewer rice cakes, etc. Here's why- there is elevated arsenic in rice.